Combine all ingredients in food processor or high-speed blender and mix. Set aside in refrigerator. Pre-heat oven to broil. On a foiled baking sheet, rub peppers with grapeseed oil and season with salt. For 5-10 minutes, roast sweet peppers until blackened and soft. Remove from oven and let cool. On stovetop, heat a shallow pan and add a pat of butter or a tablespoon of grapeseed oil. Add trimmed asparagus. Saute, adding a bit of water as you go until asparagus as charred and soft, about 10 minutes. Remove from heat and let cool. Fill medium-sized pot with water, add eggs to cold water. Bring to a boil for three minutes. Remove from heat and drain. Run ice cold water over the eggs. Once cool, discard the shell. Set eggs aside. Lower oven temp to 450 degrees. On a foiled baking sheet, place salmon, skin side down. Add a little olive oil, salt and pepper. Roast in oven for 15 minutes or until medium. Remove from oven and let cool. Once cool, using a fork add salmon to a medium-sized bowl. Add veganaise, lemon juice, celery, red onion, dijon, dill and salt and pepper. Mix well until a creamy consistency. Set aside. In a large serving platter or bowl, arrange a bed of lettuce at the bottom of the bowl. Then arrange each vegetable around the perimeter of the bowl. Place the salmon salad in the middle. 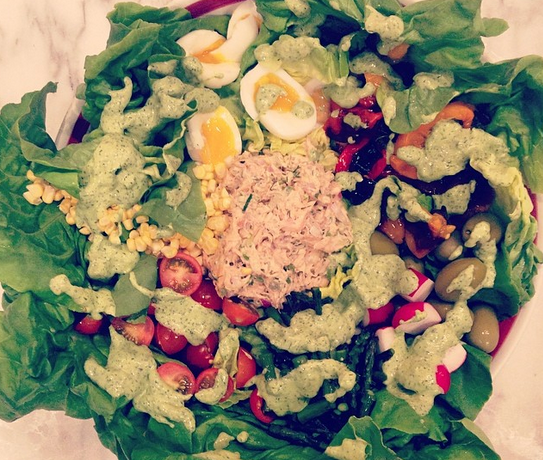 Drizzle Green Goddess Dressing over the top and serve!